The reminders app specializes in capturing tasks and items in a reminder list and reminding you about those items later. Most obvious is to set a reminder for a task to complete on a certain date. However, there are reminders that will also notify you when you arrive at a specific location. Let’s create a simple example and create a reminder to take out the garbage when your arrive at your home. 1 Launch the Reminders app. 2 Next to the + in the reminder list, type a description of the task. 6 Tap your Home (if home is identified in your Info card) from the list of locations. If it is not displayed, type an address in the search bar. 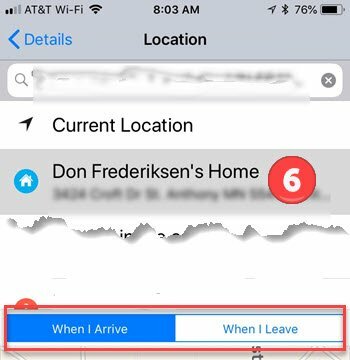 You can adjust the reminder to receive the reminder when you When I Arrive versus When I Leave the location. 7 Add priority or notes as desired. If you are thinking that this process is a little complicated for a simple reminder, using Siri makes the process very easy. How easy? Just a single line of instruction. 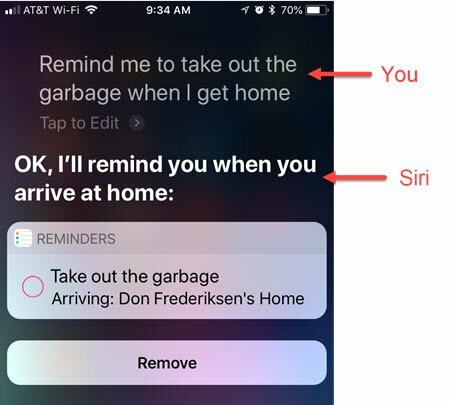 Summon Siri and say, Remind Me to take out the garbage when I get home.